Chinese Christian human rights activist Huang Yan has been granted asylum by the Taiwanese government for a three-month stay, after she successfully escaped harassment from Chinese agents in Thailand. Her freedom in Taiwan has made the Chinese regime nervous. 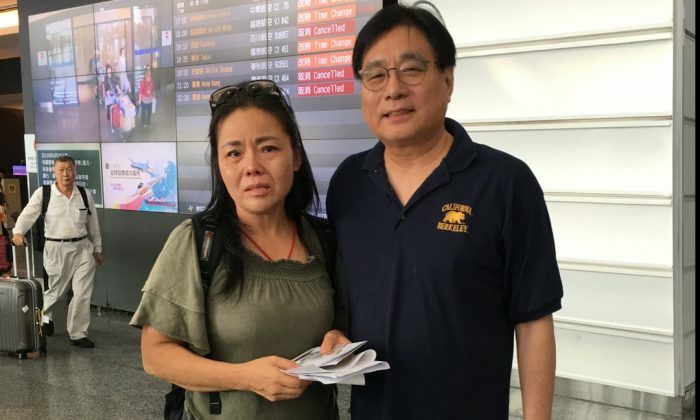 Her husband Wu Guisheng was taken away by police in the southern Chinese city of Guangzhou, and was only released after more than 10 hours of interrogation, reported Radio Free Asia (RFA) on June 18. Huang believes her husband’s arrest was the Chinese authorities’ attempt to threaten her into not speak openly while in Taiwan—as she was outspoken in her criticisms of the Chinese regime. Huang was born into a Christian family in northern China’s Hubei Province. She became a target of the Chinese regime in 2005 when she supported Cai Zhuohua, a Beijing minister in the Chinese house church movement who was sentenced to three years in prison in November 2005. House Christians have been the subject of a systematic persecution by Chinese authorities, including arrests, detention, and forced closures of their places of worship. Since then, she became an activist, throwing her support behind numerous Chinese human rights lawyers, including Gao Zhisheng, who were persecuted by the Chinese regime. Her role as a human rights activist resulted in her being repeatedly kidnapped, put under house arrest, and thrown into prison by the Chinese authorities. During one prison sentence, she was beaten so severely that she suffered a miscarriage. Huang explained how she evaded the Chinese police to successfully escape to Taiwan, in an interview with The Epoch Times. Huang was originally flying to Beijing from Thailand, but she did not continue her flight during a layover in Taoyuan International Airport in Taiwan on May 29. Instead, Huang, who has been granted refugee status by the United Nations, asked for political asylum in Taiwan. UN-recognized refugees cannot enter Taiwan legally because the island nation is not a member of the United Nations and does not have a refugee law in place. Nonetheless, the Taiwanese government granted permission for Huang to stay after the Taiwan Association for China Human Rights, a human rights NGO in Taiwan, helped present Huang’s request to relevant government agencies in Taiwan. China Aid, a Christian human rights nonprofit based in the United States, also reached out to both the United Nations High Commissioner for Refugees (UNHCR) and the Taiwanese government. Chiu Chui-cheng, deputy minister of Mainland Affairs Council of the Republic of China, Taiwan’s top government agency in charge of China policy, said the stay permission was granted to Huang after taking into consideration that Huang might be persecuted if she were returned to China. “I want to thank the Taiwanese government for successfully coming to Taiwan. I have never been treated better in the last ten years,” said Huang. She thanked the Taiwanese immigration officials for how kindly she was treated in the airport. Huang decided to make her way to Thailand after she was detained by police in southern China’s Guangdong Province in November 2015. Police charged her with “deliberately disseminating terrorist information” and a month later, formally placed her in a detention center for “obstructing official duties.” Without a trial, she was held until September 2016, according to Chinese Human Rights Defenders (CHRD), a non-government organization. She first escaped to Hong Kong with the help of pro-democracy legislators in the city, which has a legal and political system separate from mainland China. From there, Huang traveled to Thailand. In Thailand, “[Chinese agents] attacked me, harassed me, and searched me nonstop,” said Huang. For about a year-and-half, she waited for UN resettlement in a third country to no avail. Her Thai visa was due to expire, and once that happened, she explained that Chinese agents would pursue and detain her. That’s when she decided to try escaping to Taiwan with her plane ride to Beijing. Because it appeared that she would return to China on her own, her flight did not alarm the police. Thai authorities have repatriated Chinese dissidents to China in the past, even those with refugee status granted by the UN. Thailand drew international criticism in 2015, according to Reuters, for deporting Chinese dissidents Jiang Yefei and Dong Guangping. Her escape from Thailand was not without difficulty, Huang said, explaining that Chinese agents were stationed at several airports trying to stop her from boarding. This time, they allowed her to board because she had purchased a ticket with China as the end destination.